Versatile Vinyl prints using a state of the art eco-solvent large format printer. 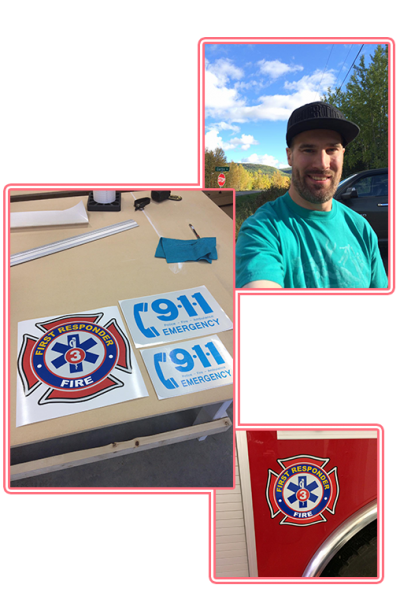 We do all our printing in Tumbler Ridge. No project too big or too small so call us today! Versatile Vinyl lives by our name – whether you need to print a correction to an existing sign or create something new we have you covered! Don’t be square! Let us cut a custom sticker for you in the shape of your logo or any other pattern. Precision cut decals will make your gear your own. Build your corporate brand. Have original swag to reward employees, sales prospects, or yourself! Quickly and easily spread your brand! We can do Magnets big and small for all your marketing needs. Also known as ACM – aluminum composite material that can withstand the elements. Perfect for your outdoor signage and advertising needs. Put your best foot forward year-round. Corrugated plastic that works great for outdoor signs. More affordable than Dibond and still looks great. We can create solid metal signs for you in a ton of sizes. Great for Parking, Caution or Hazardous goods, and Warning signs. Find out why we’re the fastest growing sign shop in the Peace! I am enthusiastic about Vinyl! This enthusiasm is rooted in my love for outdoor activities. I want to leverage my passion to help you realize your organization’s goals. Contact VV Today to find out how we can help you build your brand, spread the word, or just make things more fun! I am quickly amassing many satisfied customers. Ask around & you’ll find out how many businesses and organizations Versatile Vinyl has helped.